If you run a small business and have no funds to build a new website from scratch, the steps below will show how you can get going within minutes without it costing you a cent. Learn how you can get online and even build a website for yourself in a few minutes with no technical skills required and it won’t cost you a cent. Physical store owners including hair studios, restaurants, plumbers etc. Work from home businesses and hobbyist. If you run a business these days you need to have some online presence that is a bit more than just a Facebook page. I would like to introduce you to Google my Business. Google has made it super easy and simple to get your business online and even to help you setup a website in minutes. 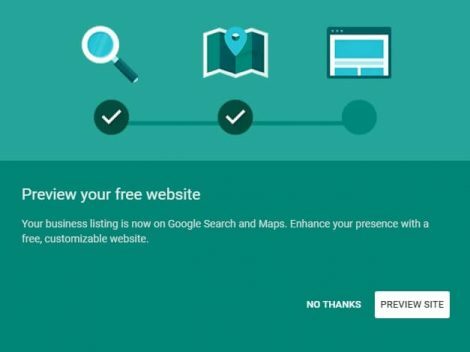 The exact 5 steps you need to take to setup a GMB listing. Also learn how to create a website in 60 seconds. A real life example of the 5 steps in action getting results! I have also created a checklist you can download to help you complete the steps: Check it out at the bottom of the post! Step 1 - Get Started. Go to https://www.google.com/business/ and click on the start now button in the top right hand corner. You will be redirected to a questionnaire form that will guide you through the setup steps which include the following. 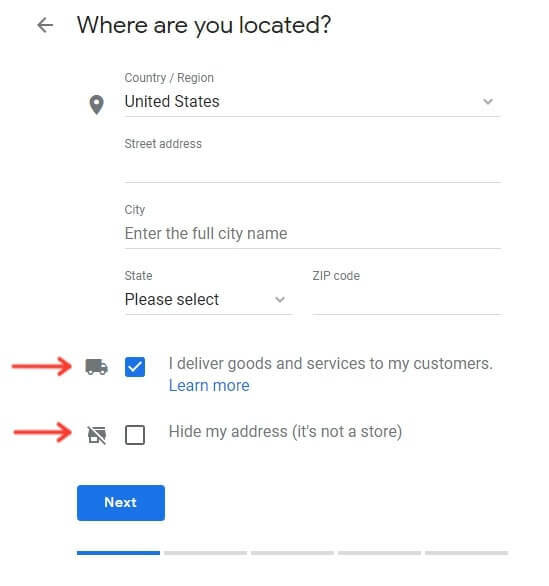 Know that Google won’t disclose your home address if you do not serve your customers from your adress, or like for it to be know. There are two options to help you with that. Service area – Add the areas you serve. Contact details – This is what your customers will be able to see. Leave the website blank as I assume you don’t have one. This step is vital for your listing to go live. GMB will send you a verification code. There are a few ways to verify your business depending on your setup. Once the code arrives you can then input it to verify your business and you are all set up. 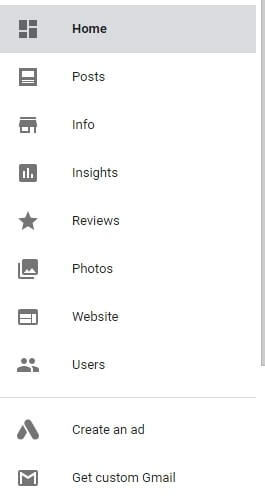 Your business now has a Google My Business page! Great now you are all ready to complete all your details. After the verification step Google will present you with a option that looks like this. This is to setup your website which you can do at a later stage, click on no thanks. You will land on your home page which serves as a form of dashboard. The next step for you is to complete all your listing details. You can find the request to do so on your dashboard. On the left, you will see a navigation menu. Posts – You can create posts. Reviews – Product and service reviews. Website – Setup your own website. Users – If you have team members that need access to your GMB you manage it from here. Now go to the Info tab. Make sure that all the info is correct and completed in as much detail as possible. Category – This is important that you choose the correct category. This tells Google what your business is. Choose something that closely categorizes your business. Address – Make sure this is constant and the same everywhere you use it. Services – If you would like to list your services complete this as well. Attributes – There will be suggestions, only add relevant ones if there is any. Some of the changes you make here will have to be verified and can take up to 3 days. Make sure you comply with the policies and guidelines provided and only supply truthful information. Ok now that all your info is in and updated let’s look at the next step, photos. Adding photos is very important for your listing according to GMB, businesses with photos get 40% more requests for directions. There are different categories of photos to keep in mind when uploading photos. By owner – Uploaded by you and include your profile photos, logos etc. By customer – Uploaded by customers. We will come back to these in the optimisation section. 360 – 360 degrees photos. Interior – Interior photos of your office etc. Exterior – Exterior views, street views etc. Video – a story about your business or insight that can help your customers. At work – Photos of you and your team working. Before adding photos make sure to change the filename to the descriptive name of the photo you have taken. Also use descriptions of the actual photo when naming the photos, for example, if its a photo of your main entrance name it main street entrance etc. Ok now that the photos are sorted let’s get to publish your very own website in 5 easy steps. Click on the website tab on the left-hand site. You will see a page similar to the one above. Now all you have to do is fill in the details, as simple as that. 1 – You will see that your site is not published yet. 2 – All the steps you have to follow. More – Choose your site address and language. Here you can change your website URL to whatever you want it. By default, it will look like this https://your-name-here.business.site you can change the your-name-here to whatever you want it. I suggest your business name or anything short. The only drawback of this whole free GMB strategy is this part. You don’t have the best looking URL (website name). But if you are on a tight budget this will work wonders. 4 – Choose a call to action button. And viola that’s how you set up a website in 60 seconds. Optimise your Google my Business in 5 easy steps. 1- Make sure your listing stay up to date and as complete as possible. Look at upcoming holidays and verify if you will be open or not etc. 2 – Publish posts on a regular basis that include news, events, offers and products. Make your posts engaging and use high-quality media. Note that posts expire after 7 days. 3- Reviews – This is where you get your mum to write about how much she loves you… just kidding. Here is how you can stand out from the crowd. Look at implementing a process around your review process. Also, remember to reply to reviews to show Google you interact with your customers. 4- Add photos regularly. Remember to describe them properly. Also encourage your visitors to upload their version of the photos they take of your location, products, etc. I like experimenting and went ahead and created a GMB listing with a free website as I explained above. I was online and ready to go within minutes, got some reviews added photos. To test it I reached out to a few prospects sending them to my newly created free website. And withing a day I had my first lead. GMB has some useful analytics that comes with it. Just to show you that you don’t always need a fancy website to start off. There are ways to bootstrap testing out your business ideas. You can check out the site I created by clicking here. That concludes the five-step process of how you create a website for free with GMB. If you have any questions or want to share your thoughts please comment below.